The Hawke's Bay Today has picked up the story on the omnishambles that is the Napier Museum. The New Zealand Taxpayers' Union has labelled the MTG Hawke's Bay museum's problems an "omnishambles", while Hastings Mayor Lawrence Yule has denied Napier Mayor Bill Dalton's claim they knew about storage issues with the facility as early as last year. At Wednesday's City Development Committee meeting, Mr Dalton said the previous council and Mr Yule were made aware last year that there were issues relating to storage at the museum. That was refuted yesterday by Mr Yule who said he would have taken steps to remedy the situation, had he known about it. "Firstly, I would have told my council straight away, because we are governors of half that collection, and two, we'd have worked out - what is the plan and how can we fix this?" he said. "There was a conversation a number of years ago about whether we should have off-site storage. It was decided not to do that, effectively because the operating costs of having two facilities would be high. "Until a week ago, that was my understanding of what was happening." Mr Dalton declined to respond to Mr Yule's denial. This week it was revealed there were storage issues at the new museum, with only as much as 40 per cent of the collection able to be housed - a figure Mr Dalton said was inaccurate. Furthermore, at Wednesday's meeting projected visitor targets were found to be grossly erroneous with this year's target of 690,000 visitors reduced to a more realistic 120,000. At the meeting tourism services manager Neil Fergus said the targets were based on the old building, which allowed for a free public flow through the Century Foyer "which is no longer relevant to the redeveloped site". Mr Dalton said yesterday he would not get involved in a debate with the New Zealand Taxpayers' Union. "We've built a magnificent new building. "We do require some fine tuning and we're going to undergo a review to get it fine tuned. End of story." He was unsure when the planned review of the MTG issues would be completed as Napier City Council chief executive Wayne Jack was away on the Hawke's Bay Regional Council's dam fact-finding trip to the South Island. "I'm not going to make any comment until we've done the review," Mr Dalton said. "Let us get the review done and see what the facts are." Meanwhile, Jordan Williams of the Taxpayers' Union said: "A three-children family doesn't build a two-bedroom house, but Napier has built a museum forgetting 40 per cent of its collection. 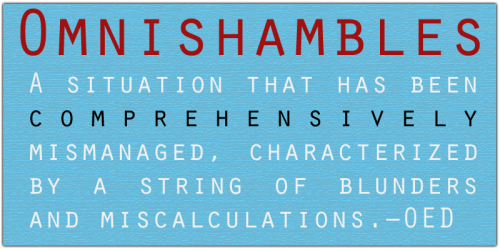 It is a complete omnishambles." Lawrence Yule contacted me this morning and said that not only did he not know of the situation in Napier, neither did Hastings District Council officials. I know Lawrence and accept his word. It appears that he's been dropped in it by Dalton. Nevertheless Hastings ratepayers helped fund this museum and deserve answers (presumably from Napier!). It appears that Hawke’s Bay mayors may have known of the omnishambles at the new museum in Napier a year ago and apparently have failed to do much about it. Napier City Council has been caught short after discovering that thousands of people it thought were visiting its museum were just popping in to use the toilets. Now it needs to revise its 10-year plan after finding that the projected visitor numbers for its new $18 million museum and gallery were based on inaccurate figures. Then we found out that the museum cannot hold the collection it was built to accommodate. In fact, it is so small up to 40% will need to stored at an as yet unknown site. Radio NZ, The Dominion Post and TVNZ covered the story. Then began the spin from Napier City Council that they knew of the problems all along, but were nevertheless conducting a 'review' on how it happened. This morning the Dominion Post reported that Hastings Mayor Lawrence Yule was aware of the situation, an allegation made by Napier's Mayor but strongly refuted by Mr Yule. The whole saga appears to be resulting in a somewhat undignified spat between the mayors of the Bay cities.